Travel across Iowa’s terrain was difficult at best in the early 1800’s. The only “roads” were paths worn by oxen drawn wagons. Roads became a necessity in Eastern Iowa in the 1830’s when the area began to see a steady population expansion. In 1830, about 50 people inhabited this area and within 8 years, the population had grown to more than 43,000. Iowa gained its territorial status in 1838. Congress recognized the need for roads but some members were reluctant. The supporters of the federal road program discovered that they could win over the opposition by designating their proposals as “military roads” to aide soldiers in transportation of supplies. In 1839, legislation was passed appropriating $20,000 for Iowa’s first federal military road from the mining and river town of Dubuque to the Missouri border in Van Buren County. The language in the legislation required the road to travel through as many county seats as possible. As soon as legislation was passed, R.C. Tilghman surveyed the route and hired Lyman Dillon of Cascade, Iowa to plow a furrow along the surveyed route between Dubuque and Iowa City which would guide the pioneer settlers until the road could be completed and eventually guide the contractors in the road construction. Lyman began his work in the fall of 1839. He used a team of 10 oxen and a large sod breaking plow. Dillon was paid $3 a mile to plow the 86 mile furrow. His provisions were carried in a covered wagon drawn by two horses. The Langworthy brothers (Edward, James and Lucius) of Dubuque were hired as the contractors for the road and work began to complete the road at the same time the capital building in Iowa City was being erected. 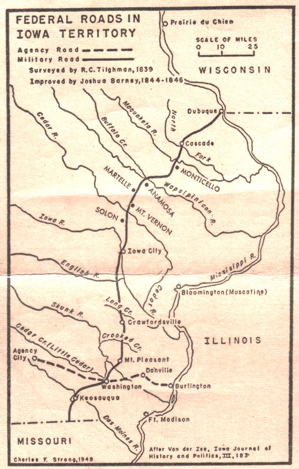 The furrow is mostly under the route of present day Highway 1 from Iowa City to Anamosa and Highway 151 from Anamosa to Dubuque. Although the military never made formal use of the “Military Road (sometimes referred to as “National Road”),the road was very important to the expansion of the Eastern Iowa areas and to the survival of the towns that were located along its path, including the town of Cascade. Lyman Dillon was born in Utica, NY on 6/12/1800. He and his brother were orphaned at a young age and he was “bound out” (adopted) to a tavern keeper who worked Lyman very hard and gave him little time for education or access to books. Lyman ran away from the tavern keeper. He worked hard and was able to attend college in Utica. He followed the mantra of the times, “Head West, young man” and was attracted to Cascade because of the many possibilities offered by water power and agriculture. He bought a track of land about two miles North of Cascade on the North Fork of the Maquoketa River and ran a sawmill. He was 39 years old when he plowed the furrow. He was later involved in other aspects of Cascade history, such as Cascade’s pursuit of a standard gauge railroad. 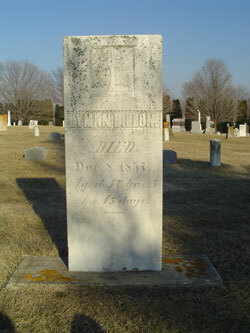 Lyman Dillon died in 1867 and was buried in Cascade’s cemetery; section A, row 22, lot 321.